Stand tall with a tight core and flat back. Hold a pair of dumbbells at your side with an overhand grip. Bend slightly at the knees as you push your hips back. Keep your chest and head up. Upper body should be almost parallel with the floor. 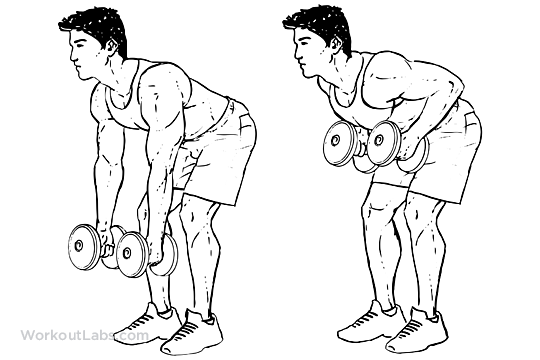 With your elbows at a 60-degree angle, bring the dumbbells up. Pause when your upper arm is parallel with the floor. Contract the muscle then slowly return the dumbbells to the starting point.